Sourdough adds a touch of its distinct flavor and chewiness to these light, moist, buttery rolls. They're baked, clustered together, in two 8" round pans, ensuring that each roll retains its soft, pillowy texture on all sides. They're perfect for soaking up a melting pat of butter, or gravy and cranberry sauce at a Thanksgiving feast. Combine all of the ingredients, and mix and knead — by hand, mixer, or bread machine set on the dough cycle — adding more flour or water if necessary to make a soft, smooth dough. While the dough is rising, lightly grease two 8" round cake pans. Transfer the dough to a lightly greased work surface, gently deflate it, and divide it into 16 pieces. Shape each piece of dough into a ball. Place eight balls in each of the round pans; if you space the balls evenly, they shouldn't touch one another. 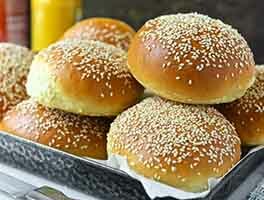 Cover the pans and allow the rolls to rise until they touch one another and are very puffy, about 60 to 90 minutes. Bake the rolls for 24 to 26 minutes, until they're a light golden brown on top; a digital thermometer inserted into one of the center rolls should read 190°F. Remove the rolls from the oven and, after 2 or 3 minutes, carefully transfer them to a rack to cool. I cannot believe how easy this recipe was. They are a bit lacking in sourdough flavor for me, but I can work on that. I didn't have potato flour, so I subbed tapioca flour (which I had for some weird reason!?). I had to add a bit of flour and tapioca flour when mixing by kitchen-aid, but being in a humid FL, I'm used to that. Also, my starter is a bit wet. These rose for 60 minutes each time, perfectly, and when baked accidentally in a 9in tin, still rose to perfection! I'm hooked. I didn't know I could bake soft rolls at home, I'm used to super crusty sourdough loafs. THANK YOU, KA! And, thank you commenters, your substitutes for the potato flour were very instrumental in my attempting this recipe. Cannot wait to make two-three batches for easter this weekend! Maybe these should be called pre-dinner rolls. They were well gone by dinner time. 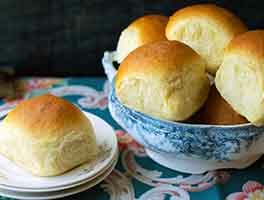 This is my absolute favorite roll recipe! 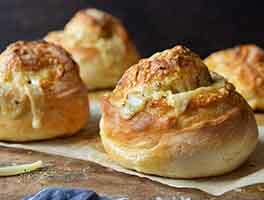 I've made it many times and it never fails to be the softest, most tasty rolls I've ever eaten! 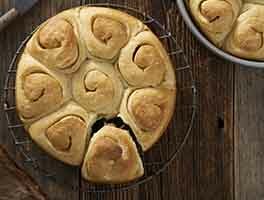 At the Holidays, these rolls were the biggest hit on the table... at every meal!!! Love this recipe. 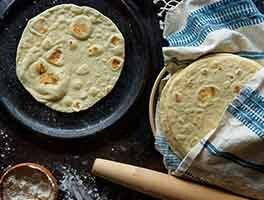 Have made several times and they are delicious- perfect texture. Quick question, would this recipe work as a loaf instead of rolls? Received starter kit for Christmas. Un-known to the gift giver it needed to be used within 3 days of receiving. Christmas was about three months later. King Arthur replaced the starter right away. I made it as stated, let set for four days, then did another batch. A week later, I made these fantastic rolls! I did bake half the recipe, and froze the other half. My plan is to bake the other eight rolls this week. The rolls were nice a soft, fluffy, and with butter, we finished them right away. Will do again, and will share my starter! Love this recipe! 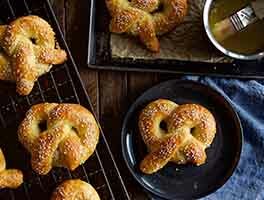 At what step could I fridge the dough for next day bake? This is the easiest and tastiest roll recipe I've ever made. Although we had soft butter on our holiday table the rolls certainly didn't need them since they are moist and delicious. I highly recommend this recipe! This is such an easy recipe. I did the first rise using my dough cycle on the bread machine and then shaped and let them rise once more for an hour. I reduced the rise time and also the yeast by 1/2 t. since I live over 5,000 ft. Excellent rolls. These rolls turned out so good! I didn't have regular sugar on hand so I used honey, and also substituted rice flour for the potato flour since that's what I had on hand. I only have 9 inch pans and the results were still good, although next time I'm going to try to divide the dough into 15 parts and use a rectanglular pan instead. Fingers crossed! Thanks for the great recipe KAF! Probably better without substitutes. I need more gluten.